Our accommodations in Dallas provide guests with a full-service experience at an affordable rate. Our hotel’s prime location near the Dallas/Fort Worth Airport and the Love Field Airport attracts guests looking to explore Dallas for pleasure or visiting on business. Our accommodations in Dallas feature 350 rooms with an eclectic, modern design. Of these rooms, 190 are double queen style rooms, perfect for traveling with a group or on a family vacation. Our standard rooms are spacious and comfortable, while certain rooms offer balconies that overlook our secluded pool and cabana area. Connect to our free Wi-Fi, take advantage of our free parking or explore the area using our free shuttle service! Staying with us for an event in one of our fabulous event spaces? Check out our special group rates! 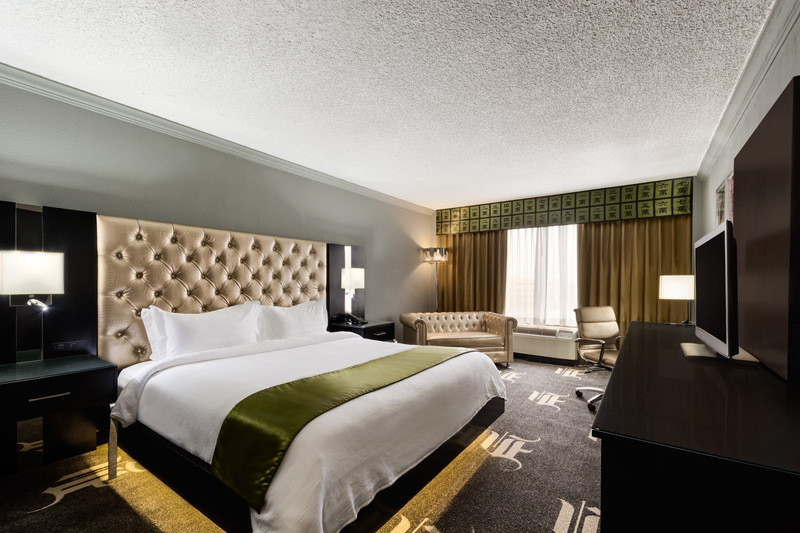 Book your stay at our accommodations in Dallas today to enjoy a comfortable night’s sleep before an exciting day in one of Texas’ greatest cities. Enjoy a night in our spacious standard king room! Equipped with a luxurious king bed, additional amenities include a flat screen TV and complimentary Wi-Fi. Traveling for business? Get your work done at our king room’s work desk! Perfect for our guest’s travelling with a family, our standard double queen comfortably accommodates 4 guests and includes additional amenities like a flat screen TV, complimentary Wi-Fi, a work desk and an iron and ironing board. Perfect for a couples retreat, our king room with a Jacuzzi features a large king bed in addition to amenities like a Jacuzzi tub with dual shower heads, a flat screen TV, complimentary Wi-Fi and an iron/ironing board. Indulge on your next trip to Dallas in our luxury king room! Featuring a large king-sized bed and amenities like a flat screen TV, complimentary Wi-Fi, and an iron/ironing board, each of our luxury king rooms boasts a balcony overlooking the atrium or pool. 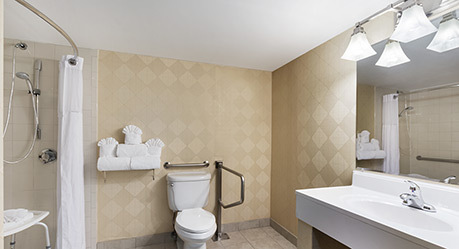 Our accessible king room allows all guests to enjoy their stay at the Wyndham Garden Dallas North hotel. Enjoy a king-sized bed and amenities like a flat screen TV, complimentary Wi-Fi and an iron in addition to a roll-in shower with grab bars in the bathroom. Enjoy a stay in one of our accessible Dallas, TX lodgings! 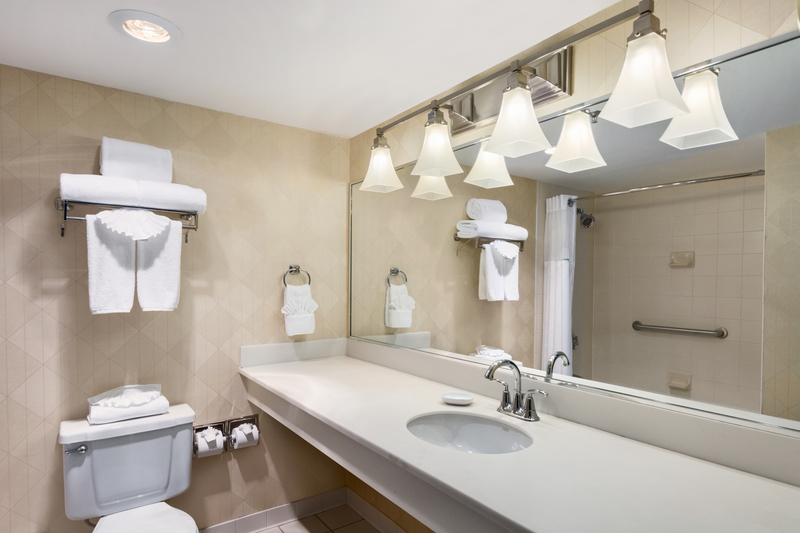 In addition to its roll-in shower and bathroom grab bars, our accessible queen room contains 2 comfortable queen beds and amenities like a flat-screen TV, a work desk and complimentary Wi-Fi. 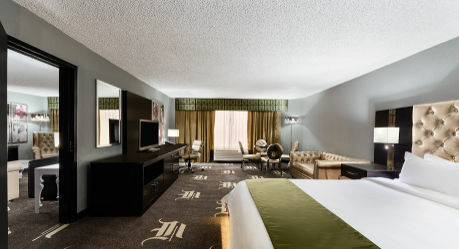 Our large corner suite is perfect for those individuals looking for luxurious accommodations in Dallas! Guests of our king corner room will enjoy our comfortable king bed in addition to amenities like a sitting area, a microwave and a work desk.